A very attractive oak front door with a rustic, country style appearance. The door has been stripped to bare wood, and has a lovely colour and grain. The door has thick raised mouldings creating a vertical paneled effect and a Gothic style arch to the top of the panels. The door has a thick base rail. 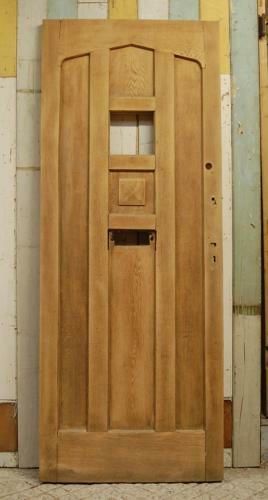 The top half of the door has a small panel, ready for glazing by purchaser and a delicate square in oak below. The door would look fantastic with plain, stained or patterned glass. The door hardwear has been removed and there is space for a letter box below the square design. The door is ready for finishing by purchaser, with perhaps a varnish or wax, suitable for exterior use. The door also requires hardwear, to be supplied by purchaser. The door is reclaimed and therefore has some signs of wear. There are some knocks and chips to the wood, especially the door edges and one corner of the bottom edge. There are some stains, marks and scratches. There are some slight colour variations in the oak. Holes and marks exist where the door hardwear has been removed. We could patch repair holes for an EXTRA CHARGE. Please talk to us if you would like a quote or advice. There are some visible patch repairs and some puttied wood knots. The letter box area has some slight damage which we could patch repair or put in a larger plate for a larger letter box (extra charge). Small holes to one edge. There is a small amount of damage to the top and the joints are missing some filler. The door is solid, with great style, ideal for a cottage or period country home. The oak is of a fantastic quality and the door is a very desireable item.